When Disney purchased Lucasfilm and the Star Wars franchise along with it, one of the first things they did was streamline the messy continuity that had come to include the comics, video games, and novels. So all that was left was the six core features, the Clone Wars animated series, and Disney XD's Star Wars Rebels. Period. 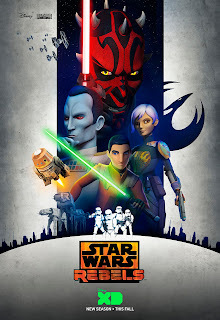 Now that's begun to change with Star Wars: The Force Awakens and new crop of books that are now considered canon, but one thing from the past that many fans were sad to see jettisoned was Timothy Zahn's "Heir to the Empire" trilogy of novels and their unforgettable villain, Grand Admiral Thrawn. So what are we getting out of this footage? Well, clearly Thrawn is going to be a major thorn in the side of the Rebels, as well he should be. In Zahn's novels he was a master strategist and historian whose battle tactics made him nearly unbeatable. Let's hope he's portrayed as such in the animated series, as well. We also see that Kanan is still blinded from last season and will be battling with Darth Maul who continues to try and push Ezra to become his apprentice. Kanan will be tapping into his connection to the Force more than ever as a result. We also see Sabine encountering fellow Mandalorians, only ones working alongside the Empire; there's a brief appearance by legendary X-Wing pilot Wedge Antilles; and of course the devious Hondo returns because he's one of the series' most entertaining characters. 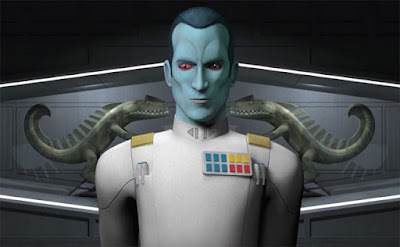 Oh, and Zahn revealed during the panel that he's writing a new book titled Thrawn which is due out in 2017. In other words, Thrawn is going to be sticking around for a while. Star Wars Celebration continues through tomorrow and you can watch it live right here.